The news has finally turned good, at least cautiously so, for the Preserve the Pensions project. And, along with The Legal Genealogist, the entire genealogical community — all of us — we all need to keep our fingers, toes and everything else crossed that the news continues to be good. The pensions for surnames from A to M went online steadily. And we all thought we were heading home. There’s always the “until…,” isn’t there? All of a sudden, we were stuck in the Ms. And stuck in the Ms. And stuck in the Ms. This isn’t the “everything’s fine, and there won’t/can’t be any more glitches” news we might have hoped for, but it’s the first cautious good news we’ve had in a while on the Preserve the Pensions project. Unfortunately most of my ancestors are S, T, V and W. I donated LOTS of money at different events for a couple of years. It’s extremely disappointing to know that I probably won’t even see results until 2019 or 2020, if M-R won’t even be done until late 2019. I understand the frustration, since I have Wisemans in my line, but at least we’re back on track. My sympathies to Karen. Even though I am in the “B’s” on my Father’s side, waiting on the “M’s” on my Mother’s side. I have donated to the fund. Know what? 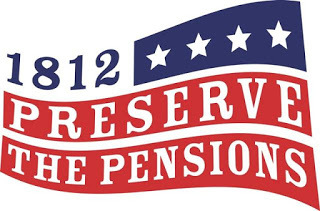 As far as I know right now, I have no ancestors who would have filed for a War of 1812 pension. Though as genealogists, we all know that could change. But what matters to me is that this priceless set of records with so much valuable information is preserved for the future. Even if we don’t have ancestors to research in that set of data, it gives all of us a picture of what life was like then, how communities function, and how families were structured. That matters. Very happy to hear that things are progressing again. As far as I know, being Australian, I have no-one in this data set. I donated on a number of occasions because I loved the way the genealogical community was coming together to support the digitisation.